Neutrophils act as the first line of innate immune defense against invading microorganisms during infection and inflammation. The tightly regulated production of reactive oxygen species (ROS) through activation of NADPH oxidase is a major weapon used by neutrophils and other phagocytic leukocytes to combat such pathogens. Cellular adhesion signals play important physiological roles in regulating the activation of NADPH oxidase and subsequent ROS formation. We previously showed that the initial suppression of the oxidase response of chemoattractant-stimulated adherent neutrophils is mediated via inhibition of Vav1-induced activation of the NADPH oxidase regulatory GTPase Rac2 by adhesion signals. In this study we show that prior exposure of neutrophils to a number of cytokines and inflammatory mediators, including TNF-α, GM-CSF, and platelet-activating factor, overcomes the adhesion-mediated suppression of ROS formation. Proline-rich tyrosine kinase 2 (pyk2) activity is enhanced under these conditions, correlating with the restoration of Vav1 and Rac2 activities. Both dominant negative pyk2 and a pyk2-selective inhibitor prevented restoration of ROS production induced by TNF-α, GM-CSF, and platelet-activating factor, and this loss of pyk2 activity resulted in decreased Vav1 tyrosine phosphorylation and subsequent Rac2 activation. Our studies identify pyk2 as a critical regulatory component and a molecular switch to overcome the suppression of leukocyte oxidant generation by cell adhesion. This activity constitutes a mechanism by which cytokines might lead to rapid elimination of invading pathogens by adherent neutrophils under normal conditions or enhance tissue damage in pathological states. Neutrophils and related phagocytic leukocytes act as the first line of innate immune defense against invading pathogens. The recruitment of leukocytes to areas of inflammation involves the adhesion and migration of these cells from the microvasculature, directional migration through the tissues, and subsequent retention at the inflammatory site (1, 2, 3). One mechanism by which these cells contain and eliminate microorganisms, fungi, and even tumor cells is via generation of reactive oxygen species (ROS).3 ROS formation occurs through the activation of NADPH oxidase (4). Although oxidant production is crucial in combating infectious organisms, ROS can also enhance inflammatory processes and cause tissue damage (5). Consequently, tight regulation of NADPH oxidase activity is required to avoid excessive ROS production and oxidative injury to healthy tissues. NADPH oxidase is an inducible electron transport system found in a variety of cell types, including leukocytes, that transfers reducing equivalents from NADPH to oxygen, resulting in the production of superoxide anion (6, 7). It consists of the membrane-integrated cytochrome b558 and several cytosolic components, including the small GTPase, Rac2 (8). NADPH oxidase exists in a dormant unassembled state in resting cells. Upon stimulation by bacteria, chemoattractants, or chemokines, Rac2 and the other cytosolic regulatory components (p47phox and p67phox) are activated and translocate to the plasma membrane, where they form an active complex with cytochrome b (9, 10). There is compelling evidence that Rac2 is an indispensable regulatory component of the phagocyte oxidase (11, 12). Previous studies have shown that the adherence of neutrophils to extracellular matrix proteins resulted in an initial suppression of stimulated ROS formation, followed by an enhanced phase of oxidant production (13, 14, 15, 16). This phenomenon of adhesion-mediated regulation of the NADPH oxidase of human neutrophils has been well documented. It is independent of secretion or protein synthesis and requires signaling via leukocyte integrins (17, 18, 19). Recently, we provided evidence that the molecular basis for the initial inhibited oxidative response is the inability of chemoattractant stimuli in the adherent leukocyte to activate Rac2 (20). Rac2 activation served as a molecular switch in activation of the adherent cell NADPH oxidase. Although the pathway for the inhibition is not fully understood, we identified tyrosine phosphorylation of the upstream Rac2 guanine nucleotide exchange factor, Vav1, as a strong candidate for the point at which inhibitory adhesion signals acted. The initial suppression of ROS formation by adhesion is thought to represent a protective mechanism to prevent inappropriate tissue damage as neutrophils travel through tissues to reach the inflammatory site(s), where enhanced ROS formation is desired. After the cells reach the inflammatory sites, leukocytes must then respond and generate microbicidal oxidants. In the current study we were interested in understanding which types of signals might be able to overcome integrin-mediated inhibition of ROS formation. We found that certain cytokines, including TNF-α, GM-CSF, and platelet-activating factor (PAF), were able to initiate rapid onset of ROS formation in fMLF-stimulated adherent neutrophils. This was accompanied by the activation of proline-rich tyrosine kinase 2 (pyk2), which was previously shown to be required for activation of adherent neutrophils by TNF-α (21, 22). We show in this study that pyk2 activation is necessary for Vav1 and Rac2 activation and the restoration of subsequent NADPH oxidase activity and ROS formation by these cytokines. Our data suggest a common molecular mechanism for rapid activation of neutrophils under conditions where inhibitory adhesion signaling is engaged. This cytokine-induced reversion of adhesion-mediated suppression of ROS formation defines a pathway by which these agents might rapidly eliminate invading pathogens by adherent neutrophils under normal conditions and/or cause significant tissue damage under aberrant conditions. This study received ethical approval from The Scripps Research institutional review board. Human blood was collected from the TSRI General Clinical Research Center donor pool by venipuncture, and neutrophils were isolated by dextran sedimentation, hypotonic lysis of erythrocytes, and centrifugation through Ficoll-Paque, as described previously (23). The cells were washed with 0.9% NaCl and resuspended in Krebs-Ringer-HEPES buffer (118 mM NaCl, 4.8 mM KCl, 25 mM HEPES, 1.2 mM KH2PO4, and 1.2 mM MgSO4) containing 5.5 mM glucose for experiments in both adherent and suspension conditions. Serum-opsonized zymosan (SOZ) was prepared by incubation of 200 mg of zymosan A particles (Sigma-Aldrich) with 20 ml of pooled human serum. IgG-opsonized zymosan (IOZ) was prepared by incubation of anti-zymosan Ab with zymosan A particles according to the manufacturer’s protocol (Molecular Probes). Vectors encoding Tat-pyk2 mutant cDNAs of Tat-pyk2 C terminus (CT) and Tat-PBM were provided by Dr. C. Nathan (Cornell University, New York, NY). Tat-CT is a fusion protein in which Tat peptide was fused to the N terminus of the proline-rich C-terminal domain of pyk2 (aa residues 680-1009), and Tat-pyk2, P13K binding motif (PBM) is a fusion protein in which Tat peptide was fused to pyk2’s PI3K binding motif (aa 581–700) (22). Escherichia coli was transformed with either Tat-CT or Tat-PBM constructs, and fusion proteins were produced as previously described (22). Briefly, E. coli cells were sonicated and centrifuged, and the resulting supernatant was loaded onto a Ni-NTA column. Pure Tat fusion proteins with N-terminal hexa-His tags were eluted with an imidazole gradient, washed, and transferred into 20 mM HEPES, pH 8.0, buffer for storage and use. For adherent cells, 24-well tissue culture plates (BD Biosciences) were coated with 50 μg/ml human plasma fibronectin (Sigma-Aldrich) overnight at 4°C, then washed with PBS three times. After blocking with 3% BSA for 1 h, the plates were again washed with PBS three times. In some experiments in which cells were pretreated with 25 ng/ml TNF-α (Pierce), 10 ng/ml GM-CSF, 1 μM PAF, or 100 ng/ml LPS (Sigma-Aldrich), the neutrophils were prewarmed at 37°C for 10 min, then added to the plates in the presence of 1 × 10−7 M fMLF (Sigma-Aldrich). In some experiments, neutrophils were stimulated with 3 mg/ml SOZ or IOZ or with E. coli at a ratio of 100:1 (E. coli:neutrophil). For suspension conditions, cells were added to polypropylene microfuge tubes coated with BSA and placed on a horizontal shaker at 200 cycles/min at 37°C. After stimulation with fMLF, neutrophils were collected at various times, and hydrogen peroxide formation was determined using the homovanilic acid-based assay (24). In some experiments, neutrophils were treated with 2.6 μM tyrphostin A9 (Calbiochem) or with 500 nM Tat-CT or Tat-PBM for 30 min as described previously (21, 22). Cell adhesion and spreading were determined as previously described (25). Briefly, neutrophils were incubated in fibronectin-coated wells for various times, then washed three times with PBS. Cells were fixed with 1% glutaraldehyde in PBS, and the numbers of adherent and spreading cells were assessed by microscopy. In experiments determining tyrosine phosphorylation of pyk2 or Vav1, 1 mg of cell lysates were incubated with rabbit anti-pyk2 or anti-Vav1 Ab (Santa Cruz Biotechnology). Immune complexes were captured by protein A-Sepharose and immunoblotted using Ab against phosphotyrosine (4G10; Upstate Biotechnology). Cell lysates (100 μg) were immunoblotted with rabbit anti-Vav1 or anti-pyk2 Ab to assess the total levels of these proteins in lysates. In some experiments, neutrophils were treated with 100 μM piceatannol (Sigma-Aldrich). Rac2 activation assays were performed using 0.4 mg of cell lysates and 10 μg of GST-Pak1 p21 binding domain (PBD), essentially as described previously (26). Proteins were separated by 12% SDS-PAGE, transferred to a polyvinylidene difluoride membrane, and blotted with specific Rac2 R786 Ab (10). A fluorometric protein tyrosine phosphatase assay kit (Calbiochem) was used to measure tyrosine phosphatase activity as previously described (27). 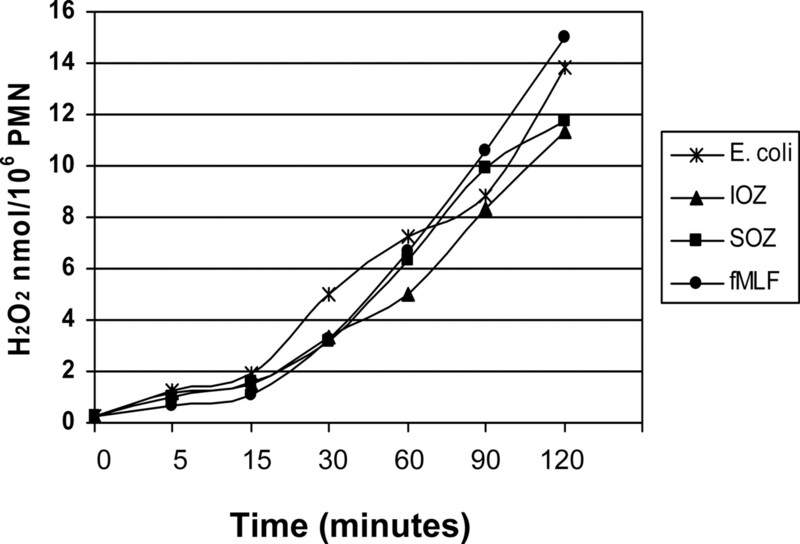 Ten micrograms of cell lysate was added to one well of a 96-well plate and incubated with a fluorogenic phosphopeptide substrate for 15 min at room temperature under very low light conditions. During the incubation, phosphopeptide substrate was dephosphorylated by the protein tyrosine phosphatase activity in cell lysate. Sodium vanadate solution was added to stop the reaction according to the manufacturer’s instructions. Subsequent incubation with chymotrypsin for 5 min resulted in cleavage of the dephosphorylated peptide and release of highly fluorescent peptide. The fluorescent intensity is proportional to the total protein tyrosine phosphatase activity, as measured using a fluorescence microplate reader. Engagement of adhesion signals, such as when phagocytic leukocytes migrate through tissues, results in inhibited ROS formation in response to a variety of stimulating agents, including the chemoattractants fMLF and C5a. Because neutrophils reaching the site of microbial infection would engage and ingest the invading bacteria and attempt to kill them through formation of various ROS, we reasoned that the bacteria themselves or associated mediators might initiate NADPH oxidase activity in adherent neutrophils. However, as shown in Fig. 1⇓, we observed that E. coli, SOZ, and IOZ were not able to initiate a rapid onset of ROS formation in adherent neutrophils. These stimuli exhibited an initial suppression of ROS formation, followed by an enhanced phase of oxidant production, a similar response as with fMLF stimulation. Adhesion-mediated suppression of the oxidative response to soluble mediators, including fMLF, provides a protective mechanism against overreaction of neutrophils and unfavorable tissue damage. The failure of particulate stimuli to overcome this suppression suggests that a regulatory mechanism might exist to enable adherent neutrophils to respond to and combat invading microorganisms. Effects of fMLP, SOZ, IOZ, and E. coli on NADPH oxidase activation of adherent neutrophils. Neutrophils plated on immobilized fibronectin (50 μg/ml) were stimulated with fMLF (1 × 10−7 M), SOZ (3 mg/ml), IOZ (3 mg/ml), or E. coli at a ratio of 100:1 (E. coli:neutrophil). H2O2 production was then measured, as described in Materials and Methods, at various times after stimulation. The results shown are representative of three independent experiments using cells from different donors. In addition to chemoattractant stimuli, adherent leukocytes exhibit delayed ROS formation in response to a variety of cytokines, including TNF-α and GM-CSF (14, 15, 16). The delayed response to TNF-α, measured as H2O2 production, is unaffected by prior exposure of neutrophils to TNF-α in suspension (14). However, we observed that the response to fMLF was markedly different. Human neutrophils were treated with 25 ng/ml TNF-α in suspension for 10 min before immobilization on fibronectin and activation by 1 × 10−7 M fMLF. Cells stimulated with fMLF in suspension or adherent cells not pre-exposed to TNF-α were used as controls. Consistent with previous reports, H2O2 production of fMLF-stimulated adherent neutrophils was initially suppressed for periods of 30–60 min. In adherent cells pre-exposed to TNF-α, however, the onset of H2O2 formation was rapid and similar in magnitude to that observed in suspension cells (Fig. 2⇓). Pre-exposure of suspension cells to TNF-α alone was not sufficient for oxidase activation, as previously reported (14). Because these signals do not affect the total amount of H2O2 product, in subsequent experiments we focused our analysis of the signaling events on cells stimulated with fMLF for 5 min. Effects of TNF-α pre-exposure on NADPH oxidase suppression by adhesion. Neutrophils were pre-exposed to 25 ng/ml TNF-α, or not. H2O2 production was then measured, as described in Materials and Methods, at various times after stimulation with fMLF (1 × 10−7 M) in nonadherent neutrophils or neutrophils plated on immobilized fibronectin (50 μg/ml). The results shown are representative of three independent experiments using cells from different donors. Pyk2 has been shown to play an essential role in the activation of adherent neutrophils by TNF-α (21, 22, 28). We therefore examined the activation of this kinase in adherent neutrophils, as assessed by tyrosine phosphorylation of pyk2. We observed that a relatively low level of pyk2 activation occurred in adherent cells stimulated with fMLF (Fig. 3⇓A). However, much stronger pyk2 tyrosine phosphorylation was observed in fMLF-stimulated cells pre-exposed to TNF-α. Indeed, the extent of this phosphorylation was comparable to the activation observed in neutrophils in suspension, in which rapid H2O2 production was elicited with fMLF. Robust pyk2 activation was observed as early as 1 min after fMLF (Fig. 3⇓B), and H2O2 formation was constant at early times after activation (Fig. 3⇓C). TNF-α alone did not stimulate pyk2 activation at early times in either adherent or suspension cells, consistent with its inability to induce ROS formation over this period. These data raised the possibility that sufficient pyk2 activation might be necessary for the initiation of an oxidative response to fMLF in adherent neutrophils. Tyrosine phosphorylation of pyk2 in response to fMLF in adherent neutrophils pre-exposed to TNF-α. A, Neutrophils were pre-exposed to 25 ng/ml TNF-α, or not. H2O2 production and tyrosine phosphorylation were then measured, as described in Materials and Methods, at the times indicated after stimulation with fMLF (1 × 10−7 M) in nonadherent neutrophils (sus) or neutrophils plated on immobilized 50 μg/ml fibronectin (adh). Total pyk2 levels (anti-pyk2 immunoblot) were essentially constant under each condition. B, Analysis of pyk2 phosphorylation at short times; same conditions as in A. 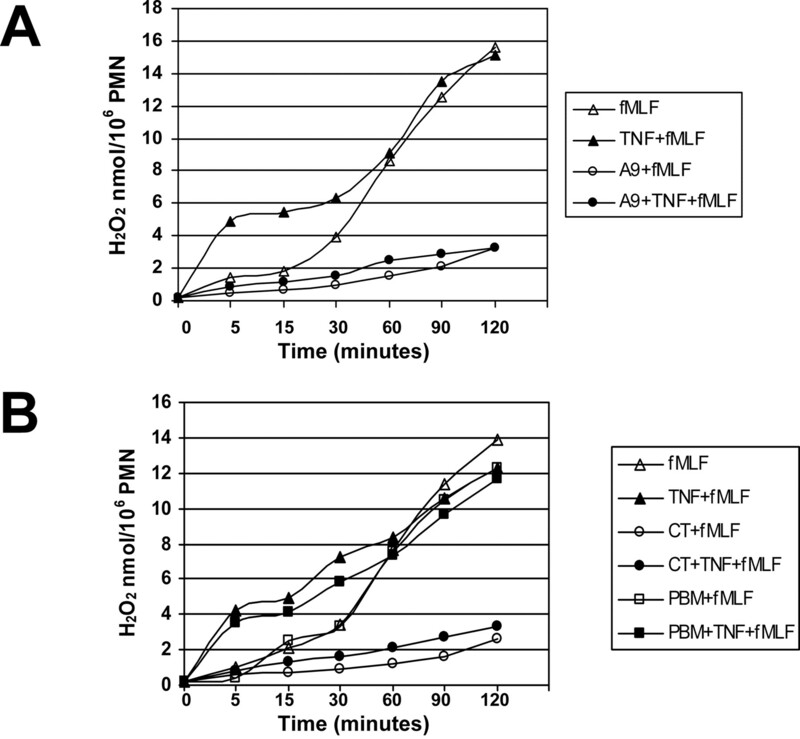 C, H2O2 production at short times in adherent cells pretreated with 25 ng/ml TNF-α, then stimulated at 0 min with fMLF (1 × 10−7 M), as described in Materials and Methods. The results shown are representative of four independent experiments using cells from different donors. To gauge whether other cytokines might modulate the effects of adhesion on the oxidative response, we pre-exposed neutrophils to other agents, including GM-CSF, PAF, and LPS, all of which have all been shown to elicit priming effects in neutrophils (29, 30, 31). Pre-exposure to GM-CSF and PAF resulted in rapid H2O2 formation and pyk2 activation in adherent neutrophils to an extent comparable to that in cells pre-exposed to TNF-α. In contrast, LPS did not stimulate pyk2 activity and did not induce reversion of adhesion-induced suppression of H2O2 formation (Fig. 4⇓). These results are consistent with the hypothesis that pyk2 activation might account for permissive activation of adherent neutrophils in response to stimulating agents. Effects of pre-exposure to TNF-α, PAF, LPS, and GM-CSF on NADPH oxidase suppression by adhesion and pyk2 activation of adherent neutrophils. Neutrophils were pre-exposed to 25 ng/ml TNF-α, 10 ng/ml GM-CSF, 1 μM PAF, or 100 ng/ml LPS or received no treatment. 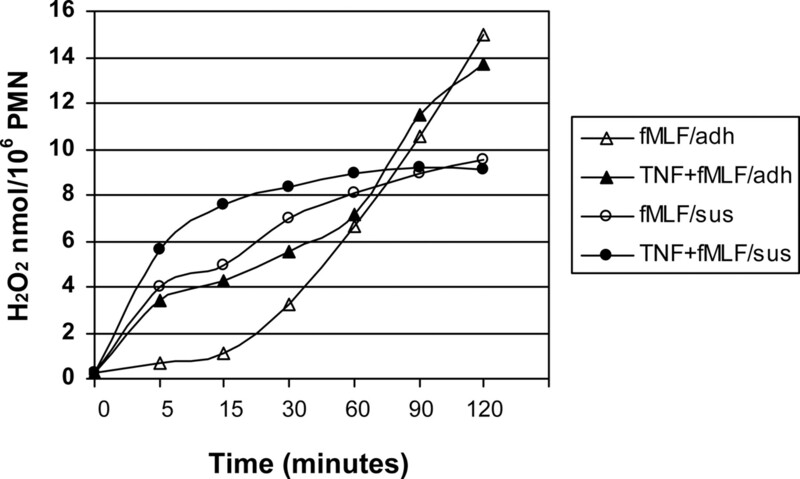 H2O2 production was then measured (A), pyk2 tyrosine phosphorylation was tested (B), and cell adhesion and spreading were scored (C), as described in Materials and Methods, 5 min after stimulation with fMLF (1 × 10−7 M) in neutrophils plated on immobilized fibronectin (50 μg/ml). Total pyk2 levels (anti-pyk2 immunoblot) were constant under each condition (B). Results shown are representative of three independent experiments using cells from different donors. It has been shown that treatment with TNF-α and GM-CSF induces actin depolymerization in neutrophils (32). To assess whether the observed ROS formation in TNF-α-pretreated neutrophils is due to altered cell adhesion, we measured the adherence properties of treated cells. Neither cell adhesion nor cell spreading in cells pretreated with TNF-α, GM-CSF, or PAF was significantly different from those in nontreated cells after 5 min of incubation on fibronectin-coated surfaces (Fig. 4⇑C). These data indicate that cytokine treatment did not alter qualitative or quantitative aspects of adhesion under our experimental conditions. To determine whether pyk2 activation is required for restoration of the oxidative response of adherent neutrophils or is merely correlative, we used the kinase inhibitor tyrphostin A9, which effectively inhibits TNF-α-induced pyk2 activation (21). Tyrphostin A9 is the most potent and selective of 51 tyrosine kinase inhibitors tested against the oxidative response of adherent neutrophils induced by TNF-α. In neutrophils treated with tyrphostin A9, the rapid production of ROS in fMLF-stimulated adherent cells pre-exposed to TNF-α was suppressed, with the response similar to that of adherent neutrophils without TNF-α pretreatment (Fig. 5⇓A). 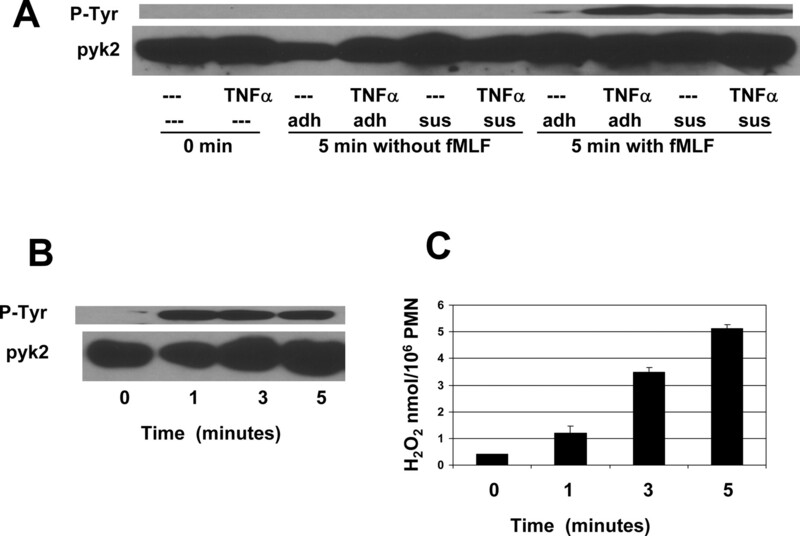 Suppression of rapid fMLF-induced H2O2 formation of adherent neutrophils pre-exposed to TNF-α by tyrphostin A9 and Tat-CT. Nontreated neutrophils or neutrophils treated with 2.6 μM tyrphostin A9 (A), 500 nM Tat-CT, or Tat-PBM (B), as described in Materials and Methods, were pre-exposed to 25 ng/ml TNF-α, or not. Cells were then tested for H2O2 at various times after stimulation with fMLF (1 × 10−7 M) under adherent conditions. The results shown are representative of three independent experiments using cells from different donors. Tyrphostin A9, although selective for pyk2, is not a specific inhibitor of this kinase (21, 22). To obtain stronger evidence that pyk2 was indeed required for the TNF-α-induced restoration of ROS production in stimulated adherent neutrophils, we used a dominant negative mutant of pyk2 to more specifically suppress pyk2 activity. Because primary neutrophils are notoriously difficult to transfect, we chose protein transduction to introduce inhibitory Tat-tagged pyk2 mutant proteins into neutrophils, as in previous studies (22, 33, 34, 35). Two recombinant Tat-pyk2 fusion proteins were produced, as described in Materials and Methods. Tat-CT, in which Tat peptide was fused to the N terminus of pyk2’s proline-rich C-terminal domain, has been shown to act as a dominant negative mutant of pyk2 (22). In contrast, Tat-PBM, in which Tat peptide was fused to pyk2’s PI3K binding motif, has only minimal pyk2 inhibitory function and was used as a control in our study. Introduction of 500 nM dominant negative Tat-CT, a concentration shown to induce maximum inhibition of TNF-α (22), resulted in suppression of the rapid fMLF-induced H2O2 formation in adherent neutrophils pre-exposed to TNF-α (Fig. 5⇑B). Tat-CT also inhibited the late fMLF-induced H2O2 formation observed in the absence of TNF-α pretreatment. In contrast, the inactive Tat-PBM had little inhibitory effect, indicting that the suppression is not due to the Tat tag or the means of transduction. We then examined whether pyk2 activation is affected. As shown in Fig. 6⇓, pyk2 tyrosine phosphorylation was greatly inhibited when Tat-CT was introduced, but not with Tat-PBM, indicating that Tat-CT targeted endogenous pyk2 activation and acted as a dominant negative mutant. These data confirm that pyk2 activation is required for pretreatment with TNF-α to reverse fMLF-stimulated ROS formation in adherent leukocytes. Suppression of pyk2 tyrosine phosphorylation of adherent neutrophils pre-exposed to TNF-α by Tat-CT. Nontreated neutrophils or neutrophils treated with 500 nM Tat-CT or Tat-PBM were pre-exposed to 25 ng/ml TNF-α, or not. Cells were then tested for pyk2 tyrosine phosphorylation 5 min after stimulation with fMLF (1 × 10−7 M) under adherent conditions. Total pyk2 levels (anti-pyk2 immunoblot) were constant under each condition. The results shown are representative of three independent experiments, using cells from different donors. Our previous study showed that Rac2 serves as a critical molecular switch whose activation is required for NADPH oxidase activation in adherent neutrophils (20). Indeed, activation of the Rac exchange factor, Vav1, and Rac2 is inhibited in adherent neutrophils, correlating with the initial inhibition of ROS formation. Therefore, we evaluated the Rac2 and Vav1 activities of adherent neutrophils pre-exposed to TNF-α. As shown in Fig. 7⇓, both Vav1 and Rac2 were activated at early times (5 min) in cells pre-exposed to TNF-α, but not in non-TNF-α-treated cells. This activation required stimulation with fMLF and was not observed with TNF-α treatment alone. In adherent TNF-α-treated cells stimulated with fMLF, both Rac2 and Vav1 activations at early time points were fully blocked when inhibitory Tat-CT was introduced into the cells. In contrast, introduction of the inactive Tat-PBM control had no effect. 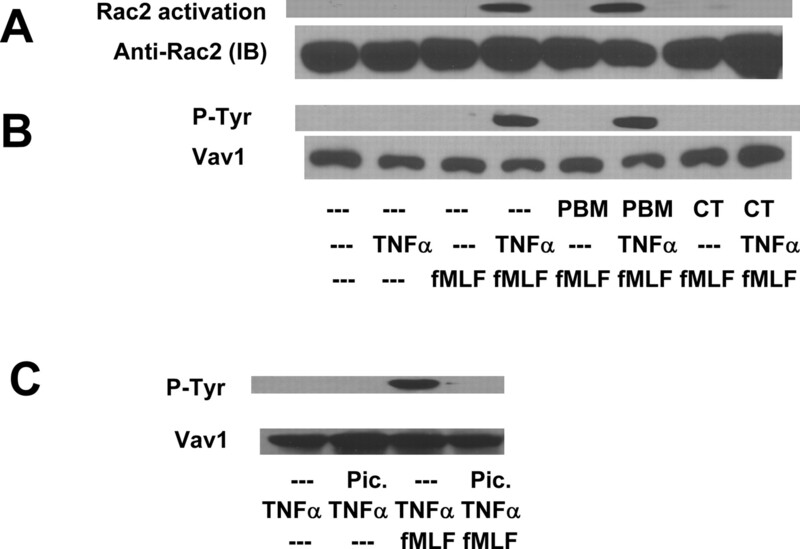 These data demonstrate that pyk2 acts upstream of Rac2 and Vav1, and that its activity is necessary to overcome the adhesion-mediated suppression of Vav1 and Rac2 activation. Suppression of Rac2 and Vav1 activation in adherent neutrophils pre-exposed to TNF-α by Tat-CT. Nontreated neutrophils or neutrophils treated with 100 μM piceatannol, 500 nM Tat-CT, or Tat-PBM were pre-exposed to 25 ng/ml TNF-α, or not. Cells were then tested for Rac2 activity (A) and Vav1 tyrosine phosphorylation (B) 5 min after stimulation with fMLF (1 × 10−7 M) under adherent conditions. Total Rac2 and Vav1 levels (anti-Rac2 and anti-Vav1 immunoblot) were constant under each condition. C, Tyrosine phosphorylation of Vav1 was evaluated after pre-exposure to 25 ng/ml TNF-α and 0 or 5 min after stimulation with fMLF (1 × 10−7 M) in the presence or the absence of the Syk inhibitor, piceatannol (1 × 10−4 M). The results shown are representative of three similar experiments obtained with cells derived from different donors. The tyrosine kinase Syk plays an important role in initiating the oxidative response of neutrophils, probably through activation of Vav1 (36). However, the role of Syk in ROS formation of adherent neutrophils pre-exposed to TNF-α has not been documented. To address this issue, we treated cells with the Syk inhibitor piceatannol and assessed Vav1 activation. Inhibition of Syk resulted in a nearly complete loss of Vav1 activation in fMLF-stimulated adherent neutrophils pre-exposed to TNF-α (Fig. 7⇑C), indicating that Syk activation is still required for Vav1 activation under these conditions. Pyk2 activation is thus necessary, but not sufficient, for Vav1 activation. We showed previously that adherent neutrophils demonstrated enhanced tyrosine phosphatase activity, which might be responsible for inhibition of Vav1 activation and subsequent ROS formation (20). Consistent with this hypothesis, the tyrosine phosphatase inhibitor, vanadate, reversed adherence-mediated inhibition, suggesting that enhanced tyrosine phosphatase activity might play a causative role in this process. To determine whether the effect of TNF-α to restore early Vav1 phosphorylation might be due to its ability to suppress adhesion-induced tyrosine phosphatase activity, we measured overall tyrosine phosphatase activity in TNF-α-pretreated neutrophils. 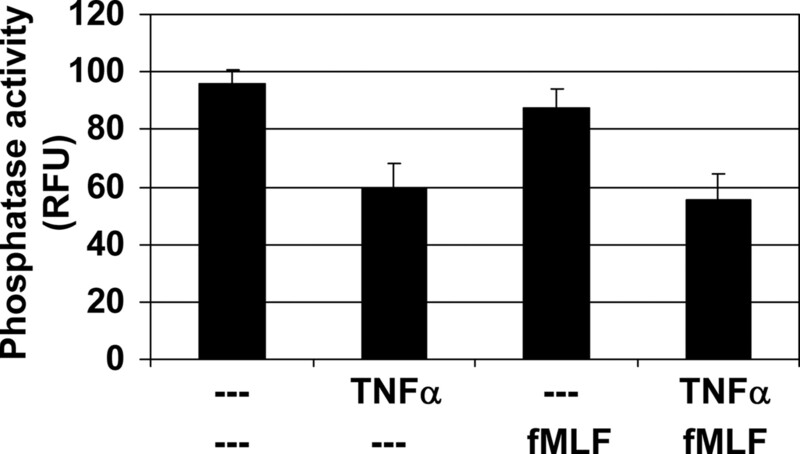 Exposure to TNF-α led to a significant decrease in overall tyrosine phosphatase activity in cells both before and after stimulation with fMLF (Fig. 8⇓), suggesting that active cytokines might restore ROS formation through their ability to overcome adherence-initiated increases in the activity of one or more tyrosine phosphatases. Suppression of tyrosine phosphatase activity in neutrophils pre-exposed to TNF-α. Nontreated neutrophils or neutrophils pre-exposed to 25 ng/ml TNF-α were stimulated for 5 min with control buffer or fMLF (1 × 10−7 M). Cells were then lysed and assayed for tyrosine phosphatase activity as described in Materials and Methods. Phosphatase activities are indicated as relative fluorescent units (RFU). The results shown are representative of three similar experiments obtained with cells derived from different donors. Adhesion signals play important regulatory roles in neutrophil activation. The engagement of adhesion receptors induces an initial suppression of ROS formation, resulting in a dramatically delayed oxidative response to a number of stimuli, such as fMLF and TNF-α (13, 14, 37). This delayed response is thought to correspond to the in situ situation, in which inappropriate ROS formation is inhibited to prevent tissue damage when cells are migrating through the tissue to inflammatory sites. After cells reach these sites, enhanced ROS generation occurs to combat invading pathogens. In vitro, restoration of ROS formation occurs spontaneously, with times varying from 30–90 min in adherent neutrophils, resulting from the activation of Rac2 (20). It has been shown that adhesion suppresses NADPH oxidase activation at early times by inhibiting Rac2 activation mediated via a membrane-associated GEF, which is probably Vav1 (20, 38). 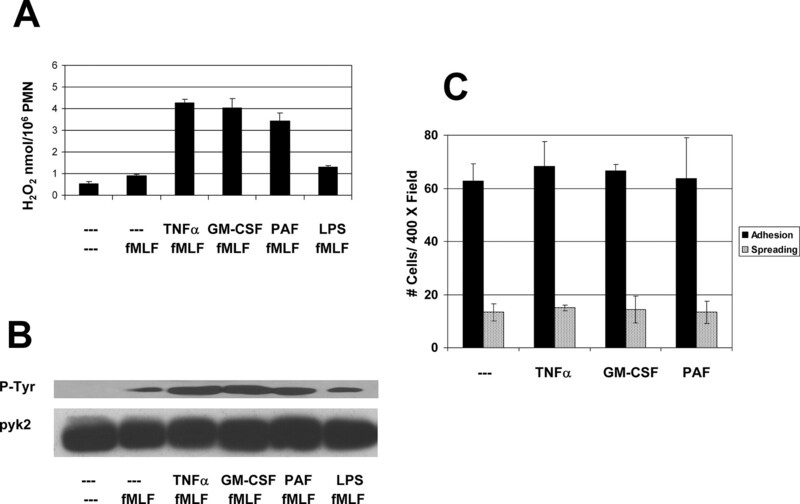 Adhesion signals suppress oxidative responses of neutrophils to a wide range of chemotactic factor and chemokine stimuli, including fMLF, TNF-α, GM-CSF, G-CSF, and C5a. In contrast, activation by the phorbol ester, PMA, is not affected (14). However, a rapid oxidative response may be required for effective host defense under adherent conditions, for example, when neutrophils encounter invading microorganisms in the vicinity of endothelial cells after completing transendothelial migration. We show that the inhibitory effect of adhesion also extends to E. coli, SOZ, and IOZ (Fig. 1⇑). This indicates that the encounter with the bacteria itself is insufficient to overcome this suppression of ROS activity, and that additional stimuli must therefore be necessary. TNF-α has been implicated in the recruitment and regulation of neutrophils at inflammatory sites (39, 40, 41, 42, 43). Levels of TNF-α are elevated in many inflammatory conditions (42, 44, 45). Therapies directed at blocking TNF-α have demonstrated therapeutic benefit for the treatment of chronic inflammatory conditions, including rheumatoid arthritis, inflammatory bowel disease, and asthma (46, 47, 48). A previous report indicated that robust and rapid ROS formation occurred in adherent neutrophils when they were first incubated with TNF-α before stimulation with fMLF (49). Indeed, we observed that pre-exposure to TNF-α led to rapid ROS formation in adherent neutrophils stimulated with fMLF (Fig. 1⇑). Additionally, pretreatment with GM-CSF and PAF (but not LPS) had similar effects (Fig. 4⇑), suggesting that these stimuli may activate a common signaling pathway to reverse adhesion-mediated suppression of ROS formation. There is accumulating evidence that pyk2 plays a critical role in the activation of adherent neutrophils by TNF-α (21, 22). Consistent with previous studies (14, 28), our data showed that stimulation of adherent neutrophils with fMLF resulted in rapid, but modest, pyk2 tyrosine phosphorylation (Fig. 3⇑). However, under these conditions no ROS formation was observed until after the suppression phase. Instead, substantial pyk2 activation, as induced by pre-exposure to TNF-α, was necessary to overcome the suppression of ROS formation at early times (Fig. 1⇑). This is in agreement with the report by Fuortes et al. (21), who showed that low levels of pyk2 tyrosine phosphorylation were observed in adherent neutrophils treated with TNF-α for short times, whereas intense pyk2 activation was observed at later times when adherent neutrophils started to generate ROS. Using a pyk2-selective inhibitor, tyrphostin A9, or the dominant negative Tat-CT construct, we confirmed pyk2’s critical role. When cells were treated with either tyrphostin A9 or Tat-CT, but not an inactive Tat-PBM control, pyk2 activity was inhibited, and pretreatment with TNF-α no longer reversed the suppression of ROS formation by adhesion (Figs. 5⇑ and 6⇑). Agents such as TNF-α and GM-CSF have been shown to have regulatory effects on the leukocyte actin cytoskeleton, including up-regulation of adhesion molecules, actin depolymerization, and stimulation/inhibition of filipodia formation (32, 50, 51, 52). These observations raised the possibility that the reversal of ROS suppression by these cytokines might be due to decreases in neutrophil adhesion. However, we observed no differences in either adhesion or spreading of TNF-α- or GM-CSF-treated cells (Fig. 4⇑C). We cannot rule out more subtle effects due to cytoskeletal disruption by these cytokines, particularly in light of the observation that cytochalasin D treatment also restores rapid ROS formation (20). However, we did not detect any activation of pyk2 in cytochalasin D-treated cells after stimulation with fMLF (data not shown). Given the significant evidence that Rac2 is a critical regulatory component of the phagocyte NADPH oxidase in adherent neutrophils (20, 38), however, we examined whether pyk2 activity modulates Rac2 activity to restore the normal oxidative response. Again, using Tat-CT, we demonstrated that the activation of both Rac2 and Vav1 was required for the action of TNF-α and pyk2 to induce rapid ROS formation (Fig. 7⇑). Thus, pyk2 activity is able to overcome the inhibition of Vav1 activation and the subsequent generation of Rac2 induced by cell adhesion. Interestingly, pyk2 has been reported to control NK cell transendothelial migration by conveying signals to Rac, also possibly via Vav1 (53). It has been extensively documented that priming of neutrophils with cytokines and chemotactic factors causes an enhanced oxidative response of neutrophils (29, 31, 54, 55). However, the molecular basis for this effect is poorly understood at best, particularly the priming effect of TNF-α, due to its broad spectrum of signaling activities. Additionally, most studies of neutrophil priming have been conducted under nonadherent conditions. In the current study we have focused on the molecular basis for the reversion of adhesion-mediated suppression of ROS formation. We have identified pyk2 as an essential regulator of this process, acting at least partially by controlling activation of the Vav1-Rac2 pathway. In our previous study we presented evidence that activation of Vav1 was suppressed by adhesion signaling through an apparent increase in the activity of one or more tyrosine phosphatases acting to promote the dephosphorylation of Vav1 and its inactivation (20). Our current data indicate that concurrent signals that stimulate pyk2 activation allow this inhibitory mechanism to be bypassed, turning on the Rac2 molecular switch and, thus, NADPH oxidase activity. This may be due to the ability of TNF-α to suppress the relevant tyrosine phosphatase activity, as suggested by the data presented in Fig. 8⇑. It does not appear that TNF-α is able to directly phosphorylate Vav1 on the critical Tyr174 site, because we found that phosphorylation at this site still required the activity of the known upstream kinase, Syk (Fig. 7⇑C). In conclusion, our study shows that adhesion-mediated suppression of ROS formation of neutrophils can be reversed by pre-exposure to a number of cytokines and chemotactic factors, including TNF-α, GM-CSF, and PAF. Pyk2 activation is essential in this process, acting to overcome inhibitory input to Vav1 and enable NADPH oxidase activation by Rac2, the critical regulatory component under adherent cell conditions. It has been recently shown that TNF-α also initiates a p38 MAPK-dependent inhibitory signal that blocks neutrophil polarization and migration (56). This suggests a scenario in which TNF-α formed at inflammatory sites both promotes the accumulation of neutrophils by decreasing leukocyte motility at these sites and initiates the local formation of ROS. Such data place TNF-α as a critical mediator promoting the innate immune functions of neutrophils at inflammatory sites. Our results suggest that under aberrant conditions, this process may be subverted to allow unfavorable tissue damage and inflammation to occur. This study provides an improved understanding of the molecular basis for the regulation of ROS formation in adherent neutrophils, enabling new insights into inflammatory disease states and the promise for novel therapeutic interventions. We are grateful to Drs. Hyunsil Han and Carl Nathan (Cornell University) for gifts of plasmids and protocols, and to Dr. Claire Doerschuk (Case Western Reserve University, Cleveland, OH) for reagents. ↵1 This work was supported by National Institutes of Health Grants HL48008 (to G.M.B.) and a fellowship from the Arthritis Foundation (to T.Z.). This is publication 17355-IMM from The Scripps Research Institute. ↵3 Abbreviations used in this paper: ROS, reactive oxygen species; IOZ, IgG-opsonized zymosan; PAF, platelet-activating factor; pyk2, proline-rich tyrosine kinase 2; SOZ, serum-opsonized zymosan; PBD, Pak1 p21 binding domain; CT, pyk2 C terminus; PBN, pyk2 P13K binding motif. Greaves, D. R., T. J. Schall. 2000. Chemokines and myeloid cell recruitment. Microbes Infect. 2: 331-336. Schall, T. J., K. B. Bacon. 1994. Chemokines, leukocyte trafficking, and inflammation. Curr. Opin. Immunol. 6: 865-873. Rot, A.. 1996. Inflammatory and physiological roles of chemokines. Pathol. Oncol. Res. 2: 16-20. Clark, R. A.. 1990. The human neutrophil respiratory burst oxidase. J. Infect. Dis. 161: 1140-1147. Smith, J. A.. 1994. Neutrophils, host defense, and inflammation: a double-edged sword. J. Leukocyte Biol. 56: 672-686. Babior, B. M., J. D. Lambeth, W. Nauseef. 2002. The neutrophil NADPH oxidase. Arch. Biochem. Biophys. 397: 342-344. Vignais, P. V.. 2002. The superoxide-generating NADPH oxidase: structural aspects and activation mechanism. Cell Mol. Life Sci. 59: 1428-1459. Bokoch, G. M., U. G. Knaus. 2003. NADPH oxidases: not just for leukocytes anymore!. Trends Biochem. Sci. 28: 502-508. Clark, R. A., B. D. Volpp, K. G. Leidal, W. M. Nauseef. 1990. Two cytosolic components of the human neutrophil respiratory burst oxidase translocate to the plasma membrane during cell activation. J. Clin. Invest. 85: 714-721. Quinn, M. T., T. Evans, L. R. Loetterle, A. J. Jesaitis, G. M. Bokoch. 1993. Translocation of Rac correlates with NADPH oxidase activation: evidence for equimolar translocation of oxidase components. J. Biol. Chem. 268: 20983-20987. Bokoch, G. M., B. A. Diebold. 2002. Current molecular models for NADPH oxidase regulation by Rac GTPase. Blood 100: 2692-2696. Dinauer, M. C.. 2003. Regulation of neutrophil function by Rac GTPases. Curr. Opin. Hematol. 10: 8-15. Hoffstein, S. T., D. E. Gennaro, R. M. Manzi. 1985. Surface contact inhibits neutrophil superoxide generation induced by soluble stimuli. Lab. Invest. 52: 515-522. Nathan, C. F.. 1987. Neutrophil activation on biological surfaces: massive secretion of hydrogen peroxide in response to products of macrophages and lymphocytes. J. Clin. Invest. 80: 1550-1560. Nathan, C. F.. 1989. Respiratory burst in adherent human neutrophils: triggering by colony-stimulating factors CSF-GM and CSF-G. Blood 73: 301-306. Nathan, C., S. Srimal, C. Farber, E. Sanchez, L. Kabbash, A. Asch, J. Gailit, S. D. Wright. 1989. Cytokine-induced respiratory burst of human neutrophils: dependence on extracellular matrix proteins and CD11/CD18 integrins. J. Cell Biol. 109: 1341-1349. Shappell, S. B., C. Toman, D. C. Anderson, A. A. Taylor, M. L. Entman, C. W. Smith. 1990. Mac-1 (CD11b/CD18) mediates adherence-dependent hydrogen peroxide production by human and canine neutrophils. J. Immunol. 144: 2702-2711. Liles, W. C., J. A. Ledbetter, A. W. Waltersdorph, S. J. Klebanoff. 1995. Cross-linking of CD18 primes human neutrophils for activation of the respiratory burst in response to specific stimuli: implications for adhesion-dependent physiological responses in neutrophils. J. Leukocyte Biol. 58: 690-697. Dusi, S., V. Della Bianca, M. Donini, K. A. Nadalini, F. Rossi. 1996. Mechanisms of stimulation of the respiratory burst by TNF in nonadherent neutrophils: its independence of lipidic transmembrane signaling and dependence on protein tyrosine phosphorylation and cytoskeleton. J. Immunol. 157: 4615-4623. Zhao, T., V. Benard, B. P. Bohl, G. M. Bokoch. 2003. The molecular basis for adhesion-mediated suppression of reactive oxygen species generation by human neutrophils. J. Clin. Invest. 112: 1732. Fuortes, M., M. Melchior, H. Han, G. J. Lyon, C. Nathan. 1999. Role of the tyrosine kinase pyk2 in the integrin-dependent activation of human neutrophils by TNF. J. Clin. Invest. 104: 32-335. Han, H., M. Fuortes, C. Nathan. 2003. Critical role of the carboxyl terminus of proline-rich tyrosine kinase (Pyk2) in the activation of human neutrophils by tumor necrosis factor: separation of signals for the respiratory burst and degranulation. J. Exp. Med. 197: 63-75. Heyworth, P. G., B. P. Bohl, G. M. Bokoch, J. T. Curnutte. 1994. Rac translocates independently of the neutrophil NADPH oxidase components p47phox and p67phox: evidence for its interaction with flavocytochrome b558. J. Biol. Chem. 269: 30749-30752. Ruch, W., P. H. Cooper, M. Baggiolini. 1983. Assay of H2O2 production by macrophages and neutrophils with homovanillic acid and horse-radish peroxidase. J. Immunol. Methods 63: 347-357. Fernandez, R., L. A. Boxer, S. J. Suchard. 1997. β2 integrins are not required for tyrosine phosphorylation of paxillin in human neutrophils. J. Immunol. 159: 5568-5575. Benard, V., B. P. Bohl, G. M. Bokoch. 1999. Characterization of rac and cdc42 activation in chemoattractant-stimulated human neutrophils using a novel assay for active GTPases. J. Biol. Chem. 274: 13198-13204. Nishikata, M., K. Suzuki, Y. Yoshimura, Y. Deyama, A. Matsumoto. 1999. A phosphotyrosine-containing quenched fluorogenic peptide as a novel substrate for protein tyrosine phosphatases. Biochem. J. 343: 385-391. Yan, S. R., M. J. Novak. 1999. β2 integrin-dependent phosphorylation of protein-tyrosine kinase Pyk2 stimulated by tumor necrosis factor α and fMLP in human neutrophils adherent to fibrinogen. FEBS Lett. 451: 33-38. Weisbart, R. H., L. Kwan, D. W. Golde, J. C. Gasson. 1987. Human GM-CSF primes neutrophils for enhanced oxidative metabolism in response to the major physiological chemoattractants. Blood 69: 18-21. Kitchen, E., A. G. Rossi, A. M. Condliffe, C. Haslett, E. R. Chilvers. 1996. Demonstration of reversible priming of human neutrophils using platelet-activating factor. Blood 88: 4330-4337. Condliffe, A. M., E. Kitchen, E. R. Chilvers. 1998. Neutrophil priming: pathophysiological consequences and underlying mechanisms. Clin. Sci. 94: 461-471. Kutsuna, H., K. Suzuki, N. Kamata, T. Kato, F. Hato, K. Mizuno, H. Kobayashi, M. Ishii, S. Kitagawa. 2004. Actin reorganization and morphological changes in human neutrophils stimulated by TNF, GM-CSF, and G-CSF: the role of MAP kinases. Am. J. Physiol. 286: C55-C64. Nagahara, H., A. M. Vocero-Akbani, E. L. Snyder, A. Ho, D. G. Latham, N. A. Lissy, M. Becker-Hapak, S. A. Ezhevsky, S. F. Dowdy. 1998. Transduction of full-length TAT fusion proteins into mammalian cells: TAT-p27Kip1 induces cell migration. Nat. Med. 4: 1449-1452. Jones, S. L., J. Wang, C. W. Turck, E. J. Brown. 1998. A role for the actin-bundling protein L-plastin in the regulation of leukocyte integrin function. Proc. Natl. Acad. Sci. USA 95: 9331-9336. Bruyninckx, W. J., K. M. Comerford, D. W. Lawrence, S. P. Colgan. 2001. Phosphoinositide 3-kinase modulation of β3-integrin represents an endogenous “braking” mechanism during neutrophil transmatrix migration. Blood 97: 3251-3258. Miranti, C. K., L. Leng, P. Maschberger, J. S. Brugge, S. J. Shattil. 1998. Identification of a novel integrin signaling pathway involving the kinase Syk and the guanine nucleotide exchange factor Vav1. Curr. Biol. 8: 1289-1299. Fehr, J., R. Moser, D. Leppert, P. Groscurth. 1985. Antiadhesive properties of biological surfaces are protective against stimulated granulocytes. J. Clin. Invest. 76: 535-542. Dib, K., F. Melander, L. Axelsson, M. C. Dagher, P. Aspenstrom, T. Andersson. 2003. Down-regulation of Rac activity during β2 integrin-mediated adhesion of human neutrophils. J. Biol. Chem. 278: 24181-24188. Berton, G., S. R. Yan, L. Fumagalli, C. A. Lowell. 1996. Neutrophil activation by adhesion: mechanisms and pathophysiological implications. Int. J. Clin. Lab. Res. 26: 160-177. Bombini, G., C. Canetti, F. A. Rocha, F. Q. Cunha. 2004. Tumour necrosis factor-α mediates neutrophil migration to the knee synovial cavity during immune inflammation. Eur. J. Pharmacol. 496: 197-204. Drost, E. M., W. MacNee. 2002. Potential role of IL-8, platelet-activating factor and TNF-α in the sequestration of neutrophils in the lung: effects on neutrophil deformability, adhesion receptor expression, and chemotaxis. Eur. J. Immunol. 32: 393-403. Gosset, P., A. B. Tonnel, M. Joseph, L. Prin, A. Mallart, J. Charon, A. Capron. 1984. Secretion of a chemotactic factor for neutrophils and eosinophils by alveolar macrophages from asthmatic patients. J. Allergy Clin. Immunol. 74: 827-834. Canetti, C. A., B. P. Leung, S. Culshaw, I. B. McInnes, F. Q. Cunha, F. Y. Liew. 2003. IL-18 enhances collagen-induced arthritis by recruiting neutrophils via TNF-α and leukotriene B4. J. Immunol. 171: 1009-1015. Thomas, P. S.. 2001. Tumour necrosis factor-α: the role of this multifunctional cytokine in asthma. Immunol. Cell Biol. 79: 132-140. Gosset, P., A. Tsicopoulos, B. Wallaert, C. Vannimenus, M. Joseph, A. B. Tonnel, A. Capron. 1991. Increased secretion of tumor necrosis factor α and interleukin-6 by alveolar macrophages consecutive to the development of the late asthmatic reaction. J. Allergy Clin. Immunol. 88: 561-571. Sivakumar, B., E. Paleolog. 2005. Immunotherapy of rheumatoid arthritis: past, present and future. Curr. Opin. Drug Discov. Dev. 8: 169-176. Sandborn, W. J.. 2005. New concepts in anti-tumor necrosis factor therapy for inflammatory bowel disease. Rev. Gastroenterol. Disord. 5: 10-18.
den Broeder, A. A., G. J. Wanten, W. J. Oyen, T. Naber, P. L. van Riel, P. Barrera. 2003. Neutrophil migration and production of reactive oxygen species during treatment with a fully human anti-tumor necrosis factor-α monoclonal antibody in patients with rheumatoid arthritis. J. Rheumatol. 30: 232-237. Test, S. T.. 1991. Effect of tumor necrosis factor on the generation of chlorinated oxidants by adherent human neutrophils. J. Leukocyte Biol. 50: 131-139. VandenBerg, E., M. D. Reid, J. D. Edwards, H. W. Davis. 2004. The role of the cytoskeleton in cellular adhesion molecule expression in tumor necrosis factor-stimulated endothelial cells. J. Cell Biochem. 91: 926-937. Bouaouina, M., E. Blouin, L. Halbwachs-Mecarelli, P. Lesavre, P. Rieu. 2004. TNF-induced β2 integrin activation involves Src kinases and a redox-regulated activation of p38 MAPK. J. Immunol. 173: 1313-1320. Gadea, G., L. Roger, C. Anguille, M. de Toledo, V. Gire, P. Roux. 2004. TNFα induces sequential activation of Cdc42- and p38/p53-dependent pathways that antagonistically regulate filopodia formation. J. Cell Sci. 117: 6355-6364. Gismondi, A., J. Jacobelli, R. Strippoli, F. Mainiero, A. Soriani, L. Cifaldi, M. Piccoli, L. Frati, A. Santoni. 2003. Proline-rich tyrosine kinase 2 and rac activation by chemokine and integrin receptors controls NK cell transendothelial migration. J. Immunol. 170: 3065-3073. Wewers, M. D., J. J. Rinehart, Z. W. She, D. J. Herzyk, M. M. Hummel, P. A. Kinney, W. B. Davis. 1990. Tumor necrosis factor infusions in humans prime neutrophils for hypochlorous acid production. Am. J. Physiol. 259: L276-L282. Condliffe, A. M., P. T. Hawkins, L. R. Stephens, C. Haslett, E. R. Chilvers. 1998. Priming of human neutrophil superoxide generation by tumour necrosis factor-α is signalled by enhanced phosphatidylinositol 3,4,5-trisphosphate but not inositol 1,4,5-trisphosphate accumulation. FEBS Lett. 439: 147-151. Lokuta, M., and A. Huttenlocker. TNF-α promotes a stop signal that inhibits neutrophil polarization and migration via a p38 MAPK pathway. J. Leulocyte Biol. In press..